In this article we’ll explore the Barcelona of Picasso’s youth. Discover the places he lived, the studios where he painted early masterpieces and the cafes and art galleries that formed his world. 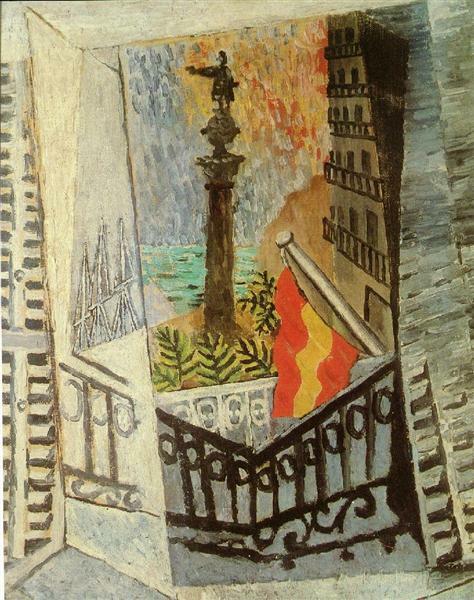 During the period in which Picasso lived in Barcelona the city was undergoing dramatic changes. 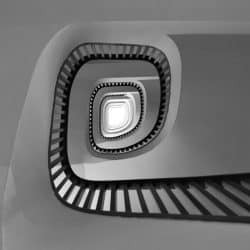 The Eixample neighborhood was being built, local industry was booming and it was becoming an increasingly cosmopolitan European city. Beginning in 1860 engineer Ildefonso Cerdá had introduced the reform and expansion of Barcelona beyond its medieval walls. Now known as the Cerdá Plan, the project urbanized the area surrounding the old town of Barcelona to reach nearby villages such as Gràcia. Pablo Picasso was born in Málaga in 1881, where his father had been a teacher at the San Telmo art school. The Ruiz y Picasso family arrived in Barcelona by boat in 1895, when Pablo was thirteen years old. His father, José Ruiz y Blasco, had been offered a post to teach figure drawing at the Llotja de Barcelona art academy. Pablo was accepted as a student at the art academy shortly after their arrival. The family’s first lodging was on Passeig d’Isabel II, near the port and across the street from the Llotja building that housed the art school. 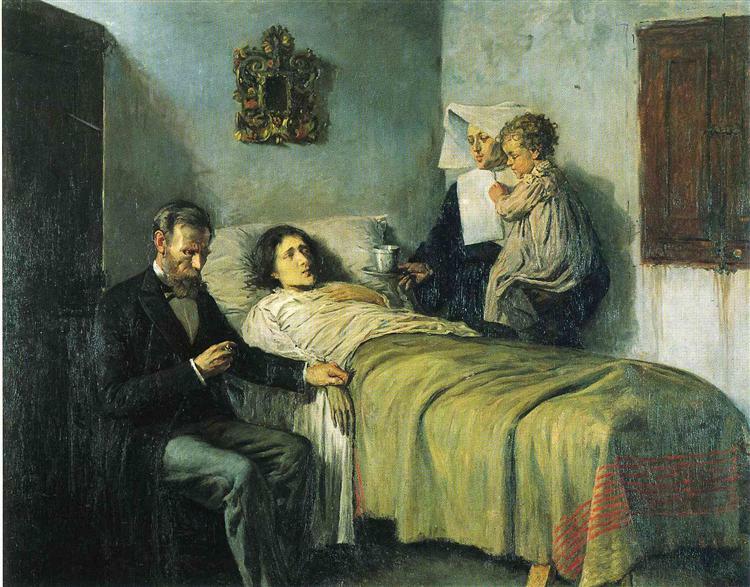 Pablo had a younger sister called Lola and another sister Conchita who had tragically died of diphtheria in 1895. 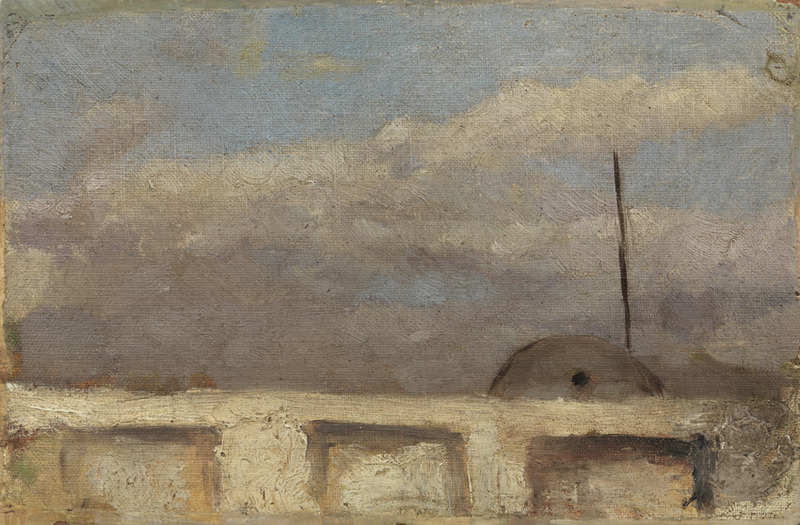 The young Picasso’s first painting in Barcelona was from the roof of this building: Rooftop of Les Cases d’En Xifré dated by the artist October 4th 1895. The Picassos soon moved to a larger flat nearby on the second floor of Carrer de Cristina number 3. The entrance was on Carrer Llauder, 4 on the corner. 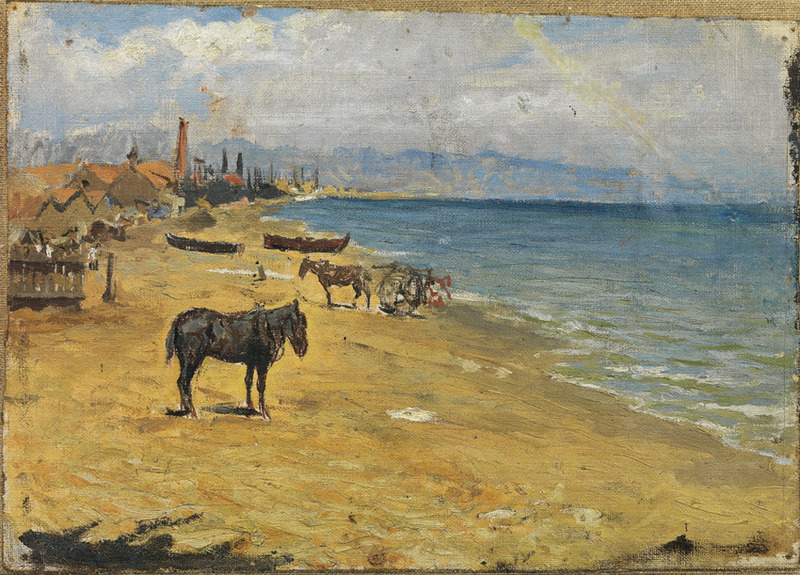 Another example of Picasso’s early work in Barcelona is his painting of the nearby Barceloneta beach dating from 1896. While Picasso is now known as a pioneer of Cubism and modern art, it is important to remember that during his childhood and youth his studies were guided by strict traditional artistic disciplines. In the summer of 1896 the family moved to Carrer de la Mercè in the Gothic Quarter, near the church dedicated to La Mercè (the patron saint of Barcelona). The building no longer exists because it was demolished to make way for the square in front of La Mercè church. 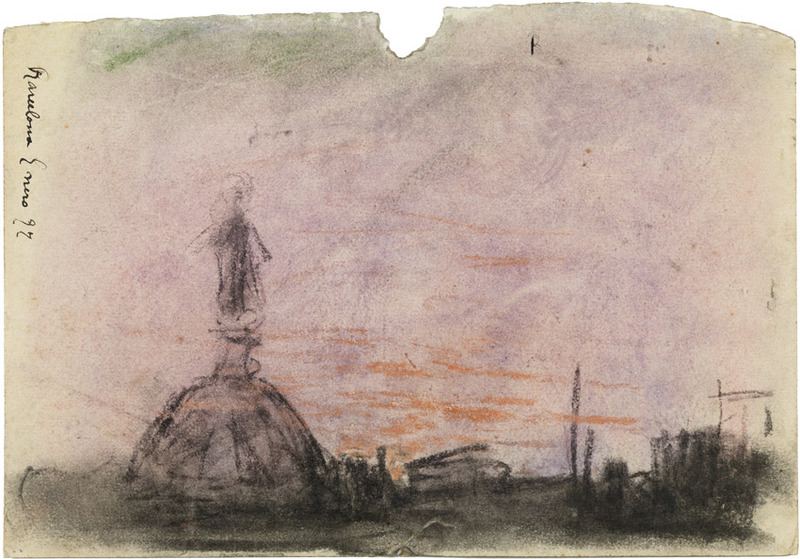 Picasso drew this pastel and pencil work of the dome of the church of La Mercè in 1897. This photo from 1900 shows an exuberant young Picasso with his friends Angel Fernández de Soto and Carlos Casagemas on the rooftop of Carrer de la Mercè, 3. In 1896, Picasso’s father rented a studio on the top floor of this building for his 14 year old son. Picasso shared the studio with Manuel Pallarés, a friend from Horta de Sant Juan who he had met in the Fine Arts School. Picasso maintained a close friendship with Pallarés throughout his life. It was in this studio that Picasso painted Science and Charity (1897) at age 15, now in the Museu Picasso de Barcelona. His next studio in 1900 was at 17, Riera de Sant Joan, a street that no longer exists due to the construction work started on Via Laietana in 1907. Picasso shared the small flat with his best friend Carles Casagemas, who he first met at Els Quatre Gats. The two young artists are said to have painted the walls with bookshelves, tables, armchairs, a sideboard with fruit, flowers and coins and even an attractive maid. In late 1900, Picasso made his life changing first trip to Paris accompanied by Casagemas. In 1901 Casagemas tragically shot himself at L’Hippodrome Café because of an unrequited love for Germaine Pichot, a dancer at the Moulin Rouge. The tragic death of his friend gave impetus to Picasso’s melancholy Blue Period. Picasso painted La Vie (Life), currently at the Cleveland Museum of Art, Ohio, from this studio in May 1903. This painting, in which Casagemas is depicted along with other figures is viewed as among his most important works from the Blue Period. After his first two trips to Paris, Picasso shared a new studio in 1902 with the sculptor Angel Fernandez de Soto and the painter Josep Rocarol in the Raval neighborhood, roughly across the street from Palau Güell. 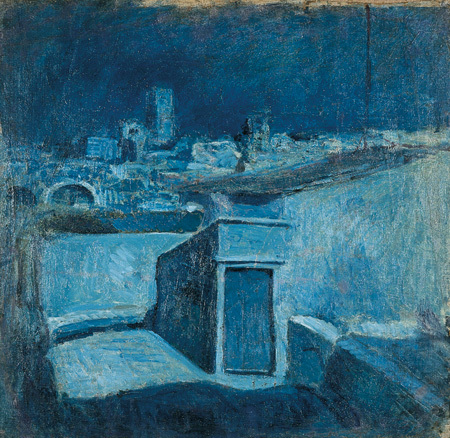 The studio was situated at the top of the building and Picasso painted roof terraces and several works from his Blue Period. The Eden Concert, a variety hall, was just next door. The venue was popular with Picasso and his friends and he drew sketches of the cuplé singers (cuplé was a popular risqué Spanish theatre song style at the time.) After his third trip to Paris in the winter of 1903, Picasso returned once again to the studio he had shared with Casagemas at Riera de Sant Joan, 17. Picasso’s last studio in Barcelona (1904) was lent him by the sculptor Pau Gargallo. This building housed three great artists almost at the same time. In addition to Picasso and Gargallo, the painter Isidre Nonell had a studio in the building. Picasso used the studio until he finally moved to Paris in April 1904. Picasso entered the School of Fine Arts (Escola de Llotja) in 1895 aged 13, where his father was also a teacher of drawing. At the time, the Fine Arts School occupied the top floor of the neoclassical building. In 1897 parents later sent him to the Royal Academy of San Fernando art school in Madrid, the most prestigious school of art in the country at the time. He disliked the formal academic teaching methods at San Fernando however and quickly stopped attending classes. He focused his attention on the great masters such as Diego Velázquez and Francisco Goya, whose work he was able to see at the Prado Museum. Picasso left Madrid for the village of Horta de Sant Joan near Tarragona to stay with his friend Manuel Pallarés. He later told his biographer Jaime Sabartés ‘everything I know, I learnt in Pallarés’ village’. Els Quatre Gats was founded by Pere Romeu, Ramon Casas, Santiago Rusinol, Miquel Utrillo and others in 1897, in imitation of Rodolphe Salis’s Parisian cabaret, Le Chat Noir. It’s original purpose was for holding gatherings of artists and as a concert and exhibition hall. It is situated in a modernist building designed by Puig i Cadafalch. 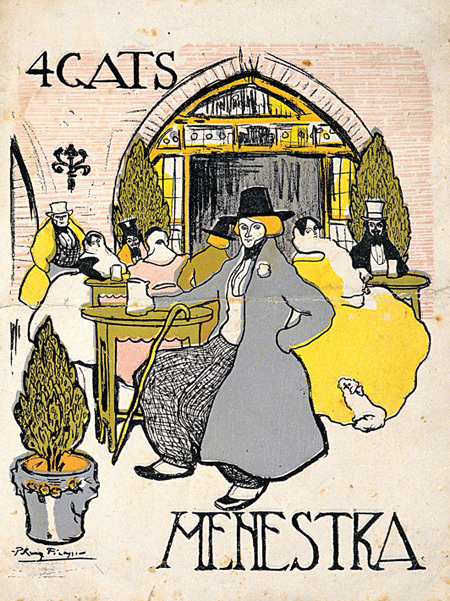 Picasso painted the menu and his first ever public exhibition was held there in February 1900. Sala Parés is where Picasso presented his first commercial gallery exhibition in 1901 at the age of 20. The gallery put on an exhibition of pastel drawings by Picasso jointly with Ramon Casas. One of the oldest art galleries in the world, Sala Parés has been located at Carrer de Petritxol, 5 in the Gothic Quarter since 1884. Joan Vidal i Ventosa’s studio, known as el Guayaba was a meeting place for artists situated in La Ribera neighborhood. The building on Placa de L’Oli was later demolished due to the opening of the Via Laietana. 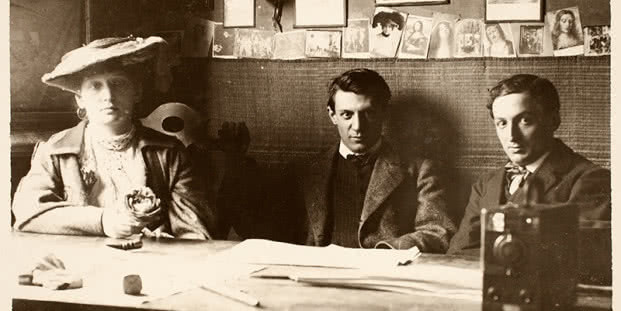 This photo shows Fernande Oliver, Picasso and Ramón Raventós at el Guayaba in 1906. The friezes on the facade of the Col·legi d’Arquitectes de Catalunya were created by the Norwegian artist, Carl Nesjar in 1960 from drawings made by Picasso. There are three friezes on the exterior of the building, depicting different scenes. On the Carrer Capellans side (pictured above), the frieze depicts the Cors de Clavé, the groups from the hermitage of Sant Medir and the “fauns” of Arrabassada and Les Planes. The Museu Picasso occupies five buildings on Carrer Montcada in the El Born neighborhood. 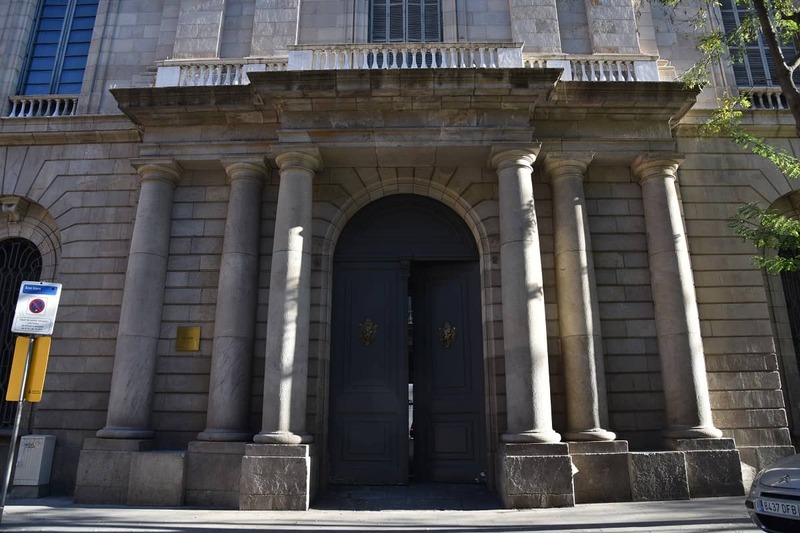 It opened in the Aguilar palace in 1963, exhibiting the private collection of Jaime Sabartés and the collection of Picasso’s work held in the art museums of Barcelona. The exhibits were later expanded with important donations by Picasso himself and the museum annexed the palace of the Baron of Castellet to accommodate them. Jacqueline Roque and Picasso’s heirs also donated works, which lead to the Meca palace being annexed in 1985. Casa Mauri and the Finestres palace were opened in 1999, in order to display temporary exhibitions. Picasso never saw the museum, having vowed to never set foot again in Spain while Franco was still in power. One of Picasso’s most renowned paintings, Les Demoiselles d’Avignon, on display at the Museum of Modern Art (MoMA) in New York City, is understood to make reference to a brothel on Carrer d’Avinyó in the Gothic Quarter. The large oil painting is described by MoMA as ‘one of the most important works in the genesis of modern art’. Commissioned by Barcelona’s city council in 1981, the Tribute to Picasso is an assemblage of modernist furniture reminiscent of the period in which Picasso lived in the city. It is situated on Passeig de Picasso next to Parc de la Ciutadella.